Elfay Pinkdot | Virtual Environments: Is one life enough? Class this week opened with some more participants delivering their elevator pitches. Following that we had a discussion, informed by the reading material set last week, about the creation of ‘content’. Students participated confidently and coherently via text and voice. Content is anything online, a person’s print on the virtual web. Content does not have to be interactive, but Daniel argued that by being online in video or text form implies it is already interactive by default. There are different types of content, but does it have any value? Some content only has meaning to the person who posted it, eg, random posts on twitter. But then meaningless to who? Or is it more a case of having value to a few people only Sometimes, commentary may only have relevance to certain people. Sometimes people use social media to hide behind and post spiteful and malicious material. They behave differently from how they may behave in the real world because there is no accountability. Internet trolls being an example. The point was made that interaction on the internet is different from face to face. This is not necessarily negative. Going back to look at your own blog, do you have a different take on what content is now? The answer was yes, creating blog posts is creating content as it is contributing something new to the internet. The Humans of New York blog is a good example of how a creator uses multiple media-images plus text to tell stories of humans. As we create content for people, we hope to make connection, often emotional connections, and it is through these connections that we project our personae into the online world. Have a think about how you are going to create content for your project and while doing so, create a credible personae for yourself to complete your assignment. Guest speaker Elfay Pinkdot was introduced to the class to talk about communities and making connections. She brought us on a field trip to Bugs and Us, a butterfly sanctuary. Once settled in the peaceful environment Elfay talked to class about online communities she has been involved in. Her SL radio programme Coffee and Pajamas is an SL group around jazz. She wanted to share her love of jazz with other SL residents. She had previously used Jazz and her love of music to teach geography, as a social lubricant, as a way in, and that was not different when trying to form the community in SL. The show was widely listened to and quickly formed into a tight community, impacting people in more ways than Elfay realises. When you start to create content or connect online, especially around something that means a lot to you, you cannot always envisage how rich a resource it can be. 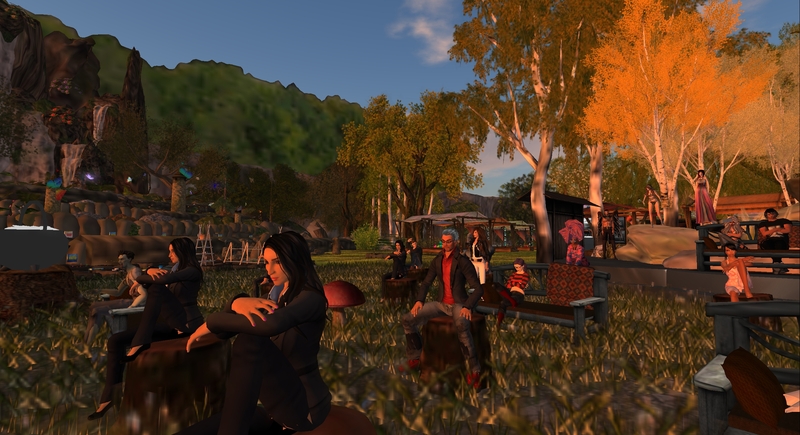 In Elfay’s case, her SL life has led her to meet with people from around the world – including the lecturers in this module. The internet can seem like a really dauntless place but what #IOLE enables you do, is take control of how you choose to use and engage with the medium of the internet, and control the message(s) you choose to put out. Elfay does not consider SL or online life different from real life… she sets boundaries just like real life. She encourages that you take responsibility as you make your mark. As was pointed out in the class, there is a lot more potential for people to think they can get away with things that are not permissible in real life. There is a huge challenge in how the law keeps up with change in the online space and the various envionmnents and changing methods of interaction. All of this is the reason why you need to give a full and measured consideration to how much of yourself you want to share online. Also, taking a lead from Sitearm Madonna, don’t be shy about playing with your identity in SL. And you are welcome to reach out to Elfay as you prepare for your final presentation and work on your project. Don’t be vulnerable, let people earn your trust, don’t underestimate the online medium. At the end of the class the lecturers told the participants about the research work they were doing around the class. We asked that you complete an anonymous survey by clicking here. Finally, DIT students are reminded that your blogs are undergoing the first of three assessments this week so make sure you are up to date! Read: this thoughtful blog post Content Licensing in Virtual Worlds about the legal issues around protecting ‘things’ you create in SL and online in general. Read the comments also. Read: The Laws of Virtual Worlds. From the California Law Review 2003 this is an excellent, if highly specialised, review of the legal position of avatars in virtual worlds. There were presentations from three guest lecturers in three different locations for this class meeting. The photograph taken at an art installation shows, from left, John O’Connor, Elfay Pinkdot, Inish Karu and Ham Rambler (in his Paddy’s Day leprechaun guise). The session begun with Ham, Mayor of Virtual Dublin, telling the story of how he came to develop the space in Second Life. It started out as an Irish Bar, The Blarney Stone, that built a regular clientele for live music, story telling and general socialising and gradually grew into a replica of the centre of Dublin City. From the elegant arena where Ham delivered his talk the class moved to the Dublin Conference Centre originally built for Dublin Tourism and containing a virtual build of the former church that now hosts the Tourist Information Office. 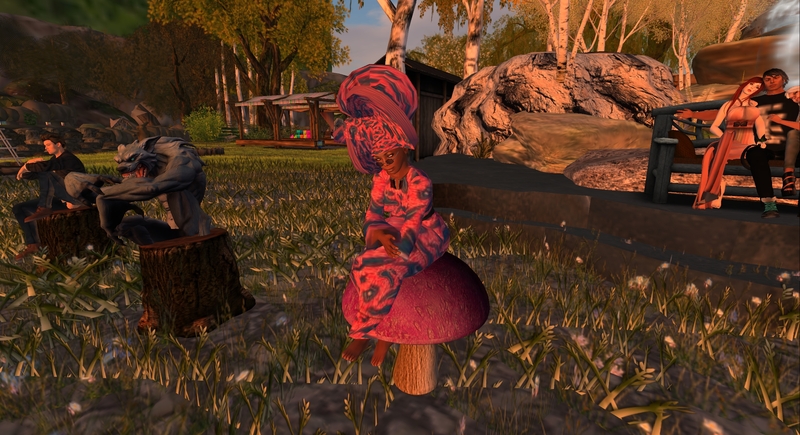 There Inish Karu, a graduate of the module, spoke about her involvement in role play in Second Life and how this led to the development of a community of role playing pirates and many long term friendships. Finally, Elfay Pinkdot brought the class to an art installation to share her experiences producing and presenting one of the longest running radio programmes in Second Life, Coffee and Pajamas Jazz programme. Post: a blog entry discussing the importance of regulation, convention and etiquette in online communities. Watch: ‘From Prosumer to Produser: Understanding User-Led Content Creation‘ (accessed 03/07/14) by Prof Axel Bruns (Creative Industries Faculty at Queensland Institute of Technology) who explains his theory of user-led collaborative content creation. Read: ‘User Generated Content and Virtual Worlds‘ (accessed 03/07/14) a paper on the legal background to creating content in an online context. After a brief summary of last weeks session on the self and personal branding, guest lecturer Elfay Pinkdot (biography) presented this week’s class. She spoke about the development of her online life – from an early interest in how things around her worked, to a specific interest in technology. As an early adopter of email, internet access, online communication and residency in virtual worlds, she has a unique perspective on their development. Describing the process of developing her online presence Elfay remarked on how it simply became an extension of her own personality. She also noted that it can often be easier to establish online relationships but that they require the same attention as any other relationship might. She was able to indulge her passion for jazz by hosting a weekly show in SL for over five years and this formed the basis of an online network that evolved into a community and led to her connecting with other communities. There was some discussion on the organisation and regulation of communities, the rules governing access to SL and their enforcement and the development of behavioural conventions and etiquette. Elfay gave some useful links in her pre-class post on this blog. For the second half of the class Elfay introduced the Dutch artist, Rob Steenhorst, who took us to his gallery in SL and spoke about how he developed his practice in SL. The fascinating insight into his development as an online artist working in 3D was both witty and informative. He also spoke of how inter-twined his SL presence has become with his RL life. Other artists he has met in SL have become friends and collaborators in RL. The evening ended with the delivery of a poem by Karima Hoisan. Many of Rob and Elfay’s SL friends were at the gallery also. Tae recommended that you make friends with these people who will be able to help you with your project and introduce you to more communities. Finally, Tae reminded everyone that he and Locks will be reviewing blogs – the first point in the assessment of the module. So, make sure your blog is up to date. Visit the artists’ community website Deviant Art. Read ‘The Laws of Virtual Worlds’ from the California Law Review. This academic paper gives a useful insight into the legal issues around online presence. View the lecture ‘From Prosumer to Produser: Understanding User-Led Content Creation’ by Prof Axel Bruns (Creative Industries Faculty at Queensland Institute of Technology). He explains his theory of user-led collaborative content creation. Post an essay (written according to academic conventions) to your blog on the importance of regulation, convention and etiquette in online communities. Minimum 500 words. Sorry my own portal site is being updated and not useful to you right now. There will be time for Q & A in chat before class ends. It’s social. loose. interactive and (supposed) to be fun! Prepare ahead of time so you can enjoy it and participate fully!